For years I arose pre-dawn and traipsed through nature amongst the flower friends. Sometimes I would lie in beds of calla lilies as the dawn's first rays hit the centre of the orange stamens. It was all about light and colour. My lens sought to capture each tiny shift of light… the fragmentary impressions created by the Light moving through the translucent leaves and petals…. Sometimes I would purchase varieties of peonies, calla lilies or brugmansia and simply immerse them in bowls of water allowing the water and light to do their magic. One becomes a co-creator with the flower as it shifts and flows. From thousands of photographs the images were culled down to a select few. The next stage of the creative process would then commence. Through creating collages of different images I would “marry” them together to enhance their unique individual expression of beauty. While in a partial meditative state I worked individually with each image, enhancing and flowing, until its essence began to emerge. It is difficult to encapsulate what is occurring here. Perhaps this process could be defined as "immersing oneself in the Divine Source of Creation" then allowing my "individual expression of Divine Source to co-create with the original pure creative expression." The end result is an expression of Creation through my individual Spiritual lens. My heartfelt desire is that these images hang in hospitals, hospices, homes for the elderly, rehabilitation centers and healing facilities so that those who are in pain or suffering in any manner can receive solace and be Divinely inspired. Eliza's images are made in a series of limited editions on canvas or archival paper. What is a Limited Edition: (Giclee on Archival Paper)? 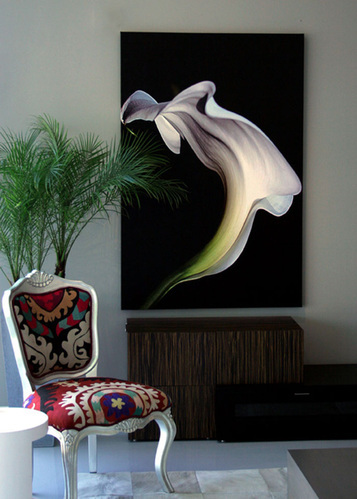 A giclee (zhee-CLAY), is an individually produced, high-resolution, high-fidelity, high tech reproduction done on a special large format printer. Because no screens are used, the prints have a higher apparent resolution than lithographs. Each print is a result of Eliza's personal collaboration with the printer. Giclees can be printed on any number of media, from canvas, to glass with light boxes, to aluminum, to watercolor paper to vinyl, to transparent acetates. Giclees are superior to traditional lithography in nearly every way. The colors are brighter, last longer, and are so high-resolution that they are virtually 'continuous tone', rather than tiny dots.